Not only is pHydrion pH Paper made right here in the USA; it is a top quality product. This is a company that has been manufacturing in the USA since the 1930s and has not moved its manufacturing operations to China. We think you should know that. 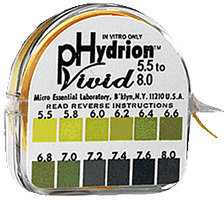 We recommend pHydrion to test for body pH as revealed in urine and saliva. This roll of pHydrion pH paper provides excellent color separation in both the acid range (below pH 7) and the alkali range (above pH 7). pHydrion is commonly used to test urine and saliva by health professionals all over the world. 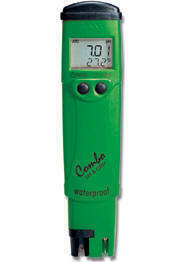 It offers an easy to read, single color match at every .2 to .3 interval from pH 5.5-8.0. 5.5 to 8.0 is the range you can expect urine and saliva to be at. a pH of 7 and above is alkaline and below 7 is acid. The objective is to get a alkaline reading. Each roll provides for approximately 100 tests. There is a strong correlation between the pH of the body's internal environment and that of the urine and saliva: urine and saliva become acidic when the body's internal environment becomes acidic. You can discover the pH of these fluids by using pHydrion pH Paper. These pH test strips are made specifically to test saliva and urine.